Antonie van Leeuwenhoek has a long tradition as a journal of general microbiology and as part of that tradition the Editors endeavour to promote microbial systematics as a fundamentally important discipline. In recent years, the numbers of manuscripts received (and consequently of papers published) in this area has increased greatly, with the majority of this manuscript type being descriptions of new microbial taxa (primarily bacterial but also significant studies of yeasts). For example, the number of manuscripts received describing new microbial taxa increased from 13 in 2009 to 40 in 2010, and 74 in 2011. Numbers for 2012 have increased yet again. To assist prospective authors we have specific guidelines for the Description of New Microbial Taxa (see menu sidebar at http://www.springer.com/life+sciences/microbiology/journal/10482). In the face of this steadily increasing flow of manuscripts, we would like to re-iterate some important features with regard to our handling of this manuscript type. Firstly, and significantly, we would like to emphasise our commitment to the principles and practises outlined in the International Code of Nomenclature of Prokaryotes (ICNP; often referred to as the Bacteriological Code; Lapage et al. 1992). Central to the operation (and undoubted success) of the ICNP is the principal of specifying nomenclatural types, whereby in order to be valid the names of novel taxa (or new combinations) have to be validly published and those names are indelibly attached to type strains deposited in recognised culture collections (more than one, preferably in geographically distinct locations). Validation of names is thus a cornerstone of bacterial systematics and raises a crucial issue for authors proposing new names in Antonie van Leeuwenhoek: whereas all names proposed for novel taxa (or new combinations) published in the International Journal of Systematic and Evolutionary Microbiology (IJSEM) are subsequently included on Notification Lists of validly published names, this is not the case for names of taxa effectively published outside the IJSEM. Consequently, authors of papers published in Antonie van Leeuwenhoek that describe new bacterial taxa and propose new names (or combinations) are reminded that it is their obligation to validate the names of these taxa by following the guidelines of the IJSEM (for details see http://ijs.sgmjournals.org/site/misc/ifora.xhtml#policy-valid), which should allow inclusion of the name of the new taxon in the Validation Lists published in IJSEM. As valid publication of a name also requires that the type strain (and preferably any other strains, if available) are deposited in culture collections, part of the evidence that needs to be provided to the IJSEM are certificates confirming strain deposition. We would like to emphasise that the Instructions for Authors for Antonie van Leeuwenhoek have now been clarified to reflect this requirement: before acceptance of a manuscript describing a novel taxon, our Editors will expect to see certificates confirming strain deposition in a minimum of two appropriate culture collections. The only exception to providing copies of certificates will be for strains where freely accessible culture collection catalogues can confirm that the relevant strain(s) have been deposited and are therefore available. However, to save Editors (or reviewers) having to check culture collection catalogues, it is strongly recommended that certificates confirming strain deposition are provided with manuscripts as additional supplementary material. We believe that these changes to our Instructions for Authors are necessary and not unduly draconian. It should also be noted that ensuring the valid publication of names will improve their visibility (and thus citation of the published work), not least as it will allow new taxa to be listed in the catalogue of microbial taxa run by Jean Euzéby (http://www.bacterio.cict.fr/classification.html). Conforming to the ICNP is essential to the good scientific practise of bacterial taxonomy. Thus, a principle concern for Editors of Antonie van Leeuwenhoek is that manuscripts describing novel taxa should convincingly demonstrate the novelty of the isolate(s) being described. Moreover, because Antonie van Leeuwenhoek is a journal of general microbiology we would expect the Introduction and/or Discussion text in manuscripts to explain why the authors undertook the study being reported and also to emphasise any interesting and novel features (beyond those needed for the taxonomic argument) of the biology of the strain(s) being described, since this should increase both the scientific value and interest in the work. Descriptions of novel taxa that include whole genome sequence data would be especially welcomed. As noted above, we wish to state our ongoing commitment not only to the principles and requirements of the ICNP but also to developing new processes that will allow the revitalisation of microbial systematics into a vibrant and modern discipline (Sutcliffe et al. 2012). 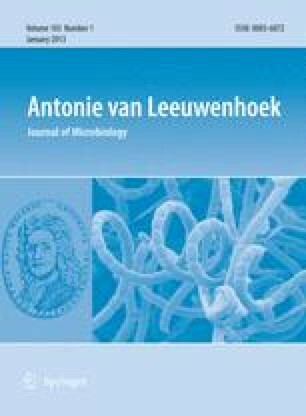 We hope that the above notes help to clarify our Editorial position with regard to the importance of valid publication of names (and the obligation of authors to validate names effectively published in Antonie van Leeuwenhoek) and the provision of evidence for the deposition of type strains.